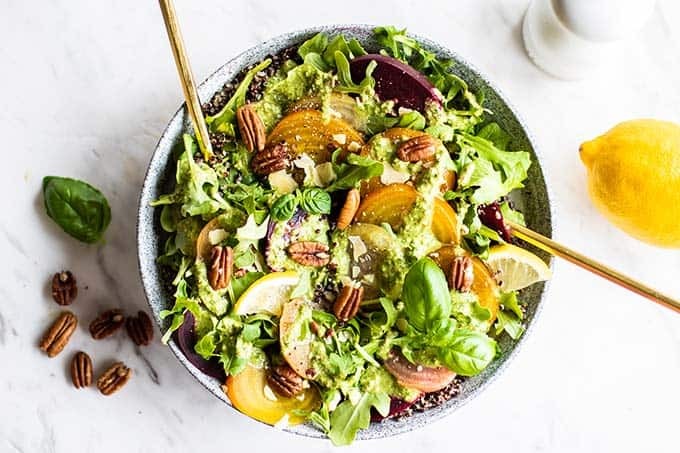 Bridge summer and fall with this flavor packed Cold Beet Salad with a Pecan Arugula Pesto. 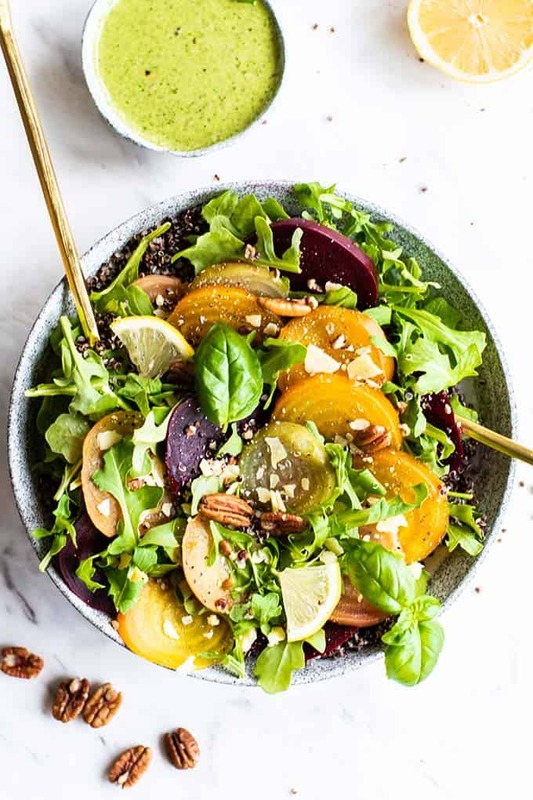 This simple vegetarian grain salad is made with high protein quinoa and has a zesty and bright arugula pesto vinaigrette – the perfect light meal or side dish! 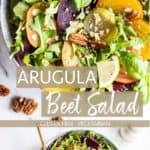 I hadn’t planned on making this salad this week, but while grocery shopping, I found a giant bag of multi colored beets that I just couldn’t resist. I came home, and immediately dumped the beets into a large pot of boiling water. We love having beets on hand to add to salads and sandwiches. They are a great higher-carb vegetable, meaning they provide sustained energy, and they are also packed with iron, folate, and potassium. Plus they just taste amazing! You can pick up packages of pre-boiled beets at most grocery stores, but I recommend making your own. Like anything, making them at home ensures they are as fresh as possible, and while it takes a bit of time, it’s very simple. Add beets to a saucepot filled with water, and bring to a low boil over medium or medium high heat. Boil for 30 minutes-1 hour, depending on the size of your beets and how many you are cooking at once. Once the beets are easily pierced with a fork, they are done. Try not to over boil them because longer cooking times will destroy some of the nutrients. Rinse them in cold water, and when they are cool enough to handle, the skins can be “pushed” off by pressing on them with your fingers. Most of the skins should very easily come off. When ready to serve, slice the beets. I also like to keep some sliced with lemon juice poured on them for easy additions to salads and sandwiches. I wanted this salad to stand alone as a vegetarian lunch, so I layered the beets on a bed of black quinoa and peppery arugula. The grain and greens are customizable based on what you have at home! Any colored quinoa will do. I chose black because it adds so much beauty to this dish! 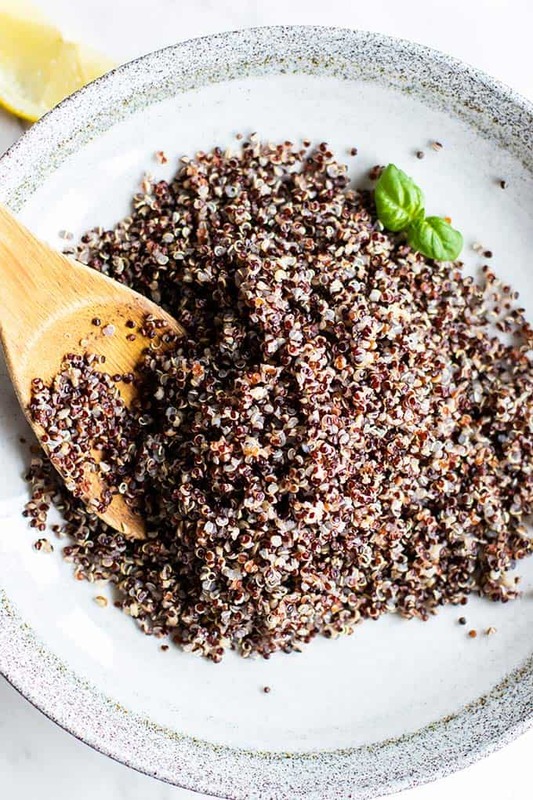 If you don’t have it on hand, millet or a wild rice blend or two other gluten free grain options that would be delicious here. 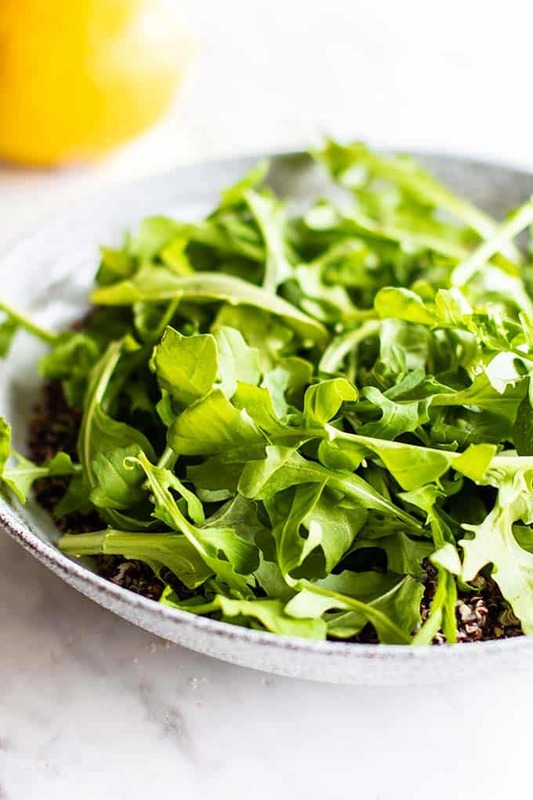 I adore peppery arugula, and I knew they would make an amazing contrast to the sweetness of the beets. You can also use spinach or even shredded kale here. I used pecans and some extra parmesan cheese to add a boost of flavor and texture. I also threw in some extra basil leaves. 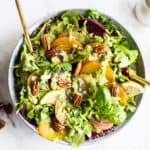 The magic of this salad really happens with the dressing! 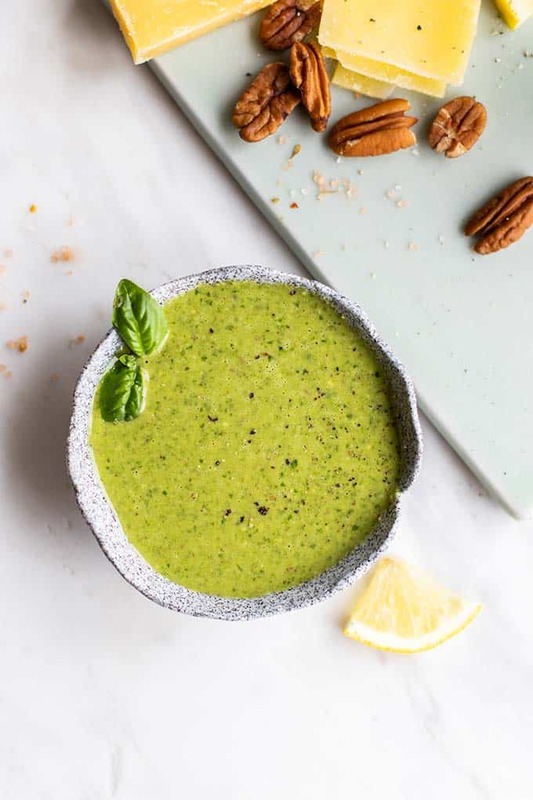 Pesto vinaigrette is so easy to make. I started with a batch of this Arugula Basil Pesto, and then thinned it out with some extra olive oil, lemon juice, and some white wine vinegar. I make this often with store bought pesto if you don’t have time to make your own pesto! 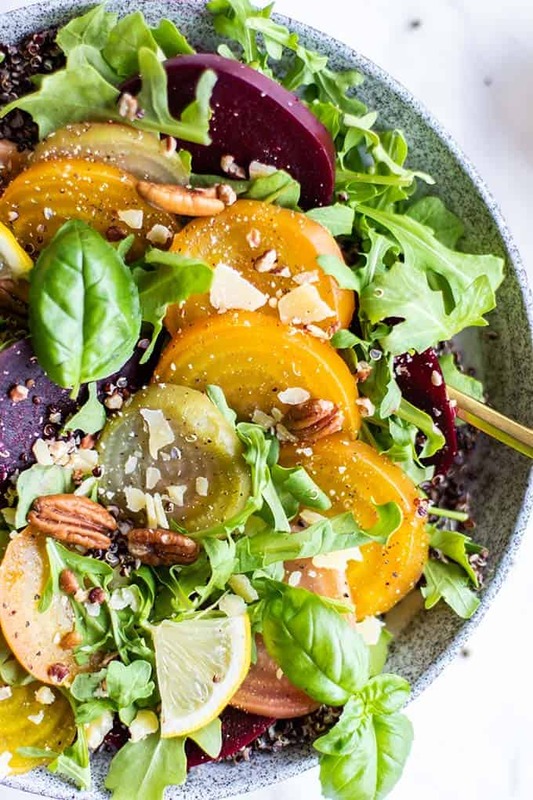 If you love beets, you don't want to miss this flavor packed salad! A vegetarian meal on it's own, or a great side dish. The magic of this salad is in the peppery and vibrant pecan arugula pesto vinaigrette. It's worth the extra 10 minutes to make your own! Add beets to a saucepot full of water, and bring to a boil over medium to medium high heat. Boil beets for 30-60 minutes, depending on size and quantity of beets. The beets are ready when they are easily pierced with a fork. Drain the beets, and run them under cool water. Chill, and then remove the skins by pressing on them with your fingers until the skins slip off. Layer cooked quinoa, arugula, and beets, and then top with parmesan cheese, pecans, and extra basil, if desired. Make vinaigrette by stirring all ingredients together. A store bought pesto will work if you do not have time to make a fresh batch. Serve salads with the pesto vinaigrette. 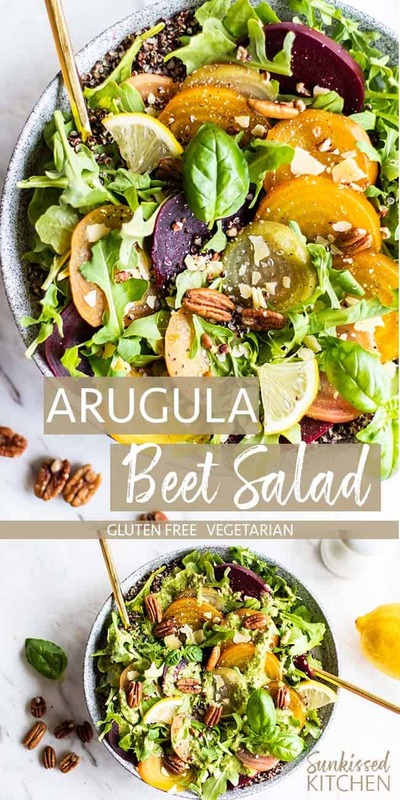 This Cold Beet Salad post may contain affiliate links, meaning if you make a purchase, I will receive part of the sale as a comission. This helps me continue to bring you lots of fresh and inspired recipes! This salad is incredible - absolutely love it. Thanks Michelle for taking so much time to make all these great recipes available. Thanks so much for letting me know Mindy! 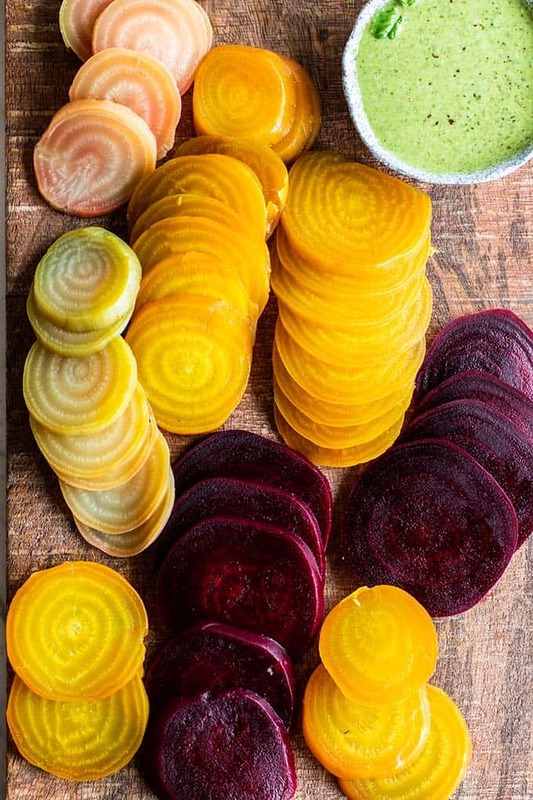 I adore beets and this simple combo is just perfect.